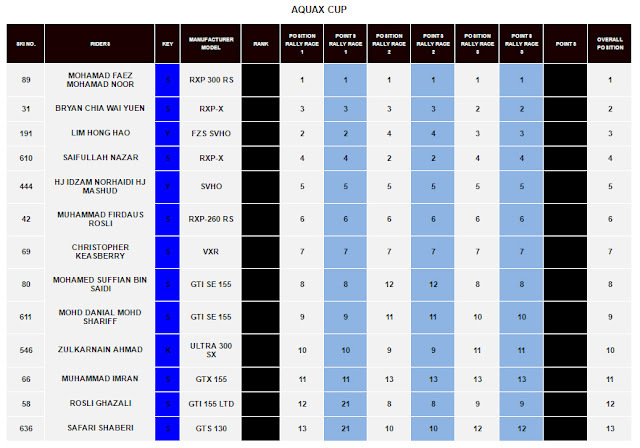 The P1 AquaX Malaysia Round 2 came and gone, what an exciting weekend of racing by the respective racers at the competition. 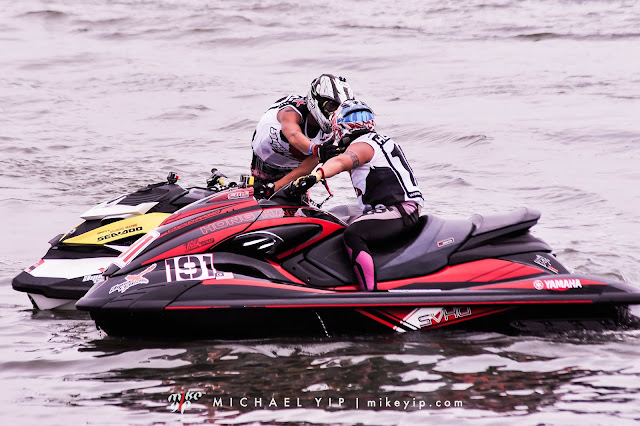 The competition was faster than Round 1 as the calmer lake encourage a faster speed and the riders can push their jet skis to the limit compared to the choppy lake at Metropolitan Lake. Didn't take as much photos as the 1st round but here's an interesting view from the helmet cam as we watch the footage from the race, with the racers competing in Race 3 of the Sprint Spark race. The official photographer of the race managed to capture quite a number of exciting moment and one of it was this exciting battle at Turn 1 during the Enduro race where 2 racers collided. For the photo album, here they are. The 3rd Round of the race will also be held at D'Island Residence on the 10th and 11th of December, not sure if I'm going to be there but will post up the results nevertheless when I received them from the organizer come race day. 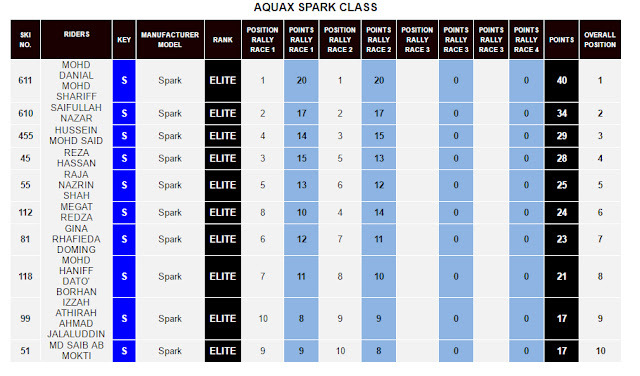 21 riders goes into Round 2 of the P1 AquaX Malaysia series at D’Island Residence, Puchong with plenty to fight for across the Sprint and Enduro series. 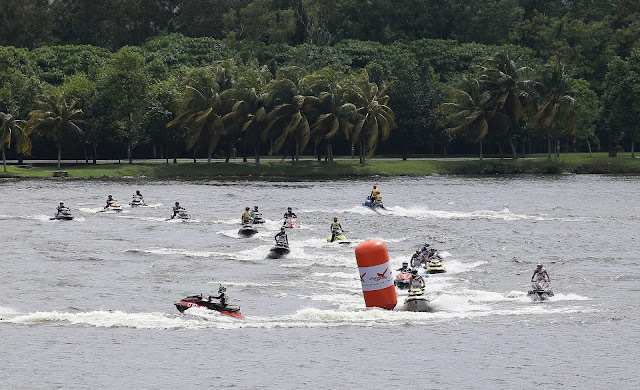 The riders also had to adapt to a flatter water surface and a larger course here in Puchong. Because of the flat characteristic of the pond at Puchong, the riders get to concentrate on pushing for faster speed and agility at the corners. On Saturday, in the Enduro 300hp category, Mohd Faez Mohd Noor put the disappointment of not finishing his first race in Kepong behind him with an impressive victory in his first race here at Puchong to take an early lead atop the point standings. The 22-year-old finished ahead of second placed Lim Hong Hao and last round’s champion Bryan Chia, who had to settle for third. In the Enduro 200 class, 47-year-old Christopher Keasberry of Brunei once again dominated the field to take a lead atop the standings after one race. He is trailed by Mohamed Suffian bin Saidi in second place and Mohd Danial Mohd Shariff in third. Mohd Danial Mohd Shariff also starred in the Sprint Spark class, continuing his fine form from the first round in Kepong with victories in both of his category’s races today. After two races, the 19-year-old leads by 6 points in the standings for Round 2, ahead of Saifullah Nazar, who finished second in both races, and Hussien Mohd Said, who placed fourth in the first race and third in the second. Sunday kicked off with the riders getting briefed on the day's race in the rain but the sky quickly cleared as the 1st race of the day was about to get under way. In the Enduro 300, Mohamad Faez Mohamad Noor completed a clean sweep of victories in all three of the Enduro Class races to emerge champion in the Enduro 300 category as well as take home this weekend’s Enduro Cup. “I’m very happy and a little bit speechless. I have been training very hard every weekend and whenever I am not working, so it’s a good feeling to win. I am appreciative to my family and AquaX and all those who have supported me,” said the 23-year-old. Second place in the Enduro 300 category this weekend went to last round’s champ Bryan Chia while Lim Hong Hao, who finished in second place last round, had to settle for third place. In the Enduro 200 category, Brunei’s Christopher Keasberry took top honours for the second round in a row with a clean sweep of victories in all three of this weekend’s races. The 47-year-old remains undefeated in all six races over the two rounds. Second place for the second round in a row was Mohamed Suffian bin Saidi, while Mohamed Danial Mohamed Shariff took the final podium spot in the Enduro 200 category. In the Sprint Spark category, Saifullah Nazar finally managed to overcome rival Mohd Danial Mohd Shariff to win the first race of the day. 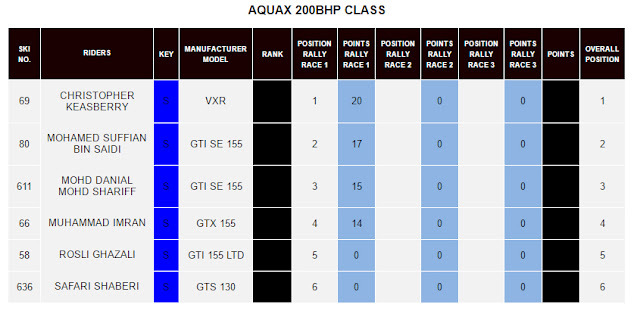 He also finished second in the second race to amass a total of 71 points and emerge the Round 2 champion by a close margin of just two points. “I’m very happy because this is my first big victory. The race here was a bit different because the track here is bigger and therefore the water is less choppy while racing. 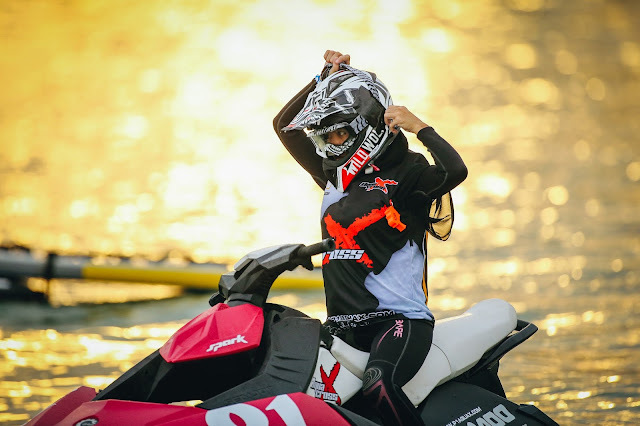 I hope to get top position again in Round 3,” said the 24-year-old, who has been racing jet skis for the last eight years. Coming in second place in the Sprint Spark category was Round 1 champ Mohd Danial, with Raja Nazrin Shah taking third place on 60 points. With 1 more round to go, Bryan Chia and Mohamed Faez are the clear front-runners to take home the title and are looking forward to a final showdown on the 10 & 11 of December. For those looking for photos from the event, that'll be in the next post, along with a helmet cam from the 3rd race in the Sprint Spark category. 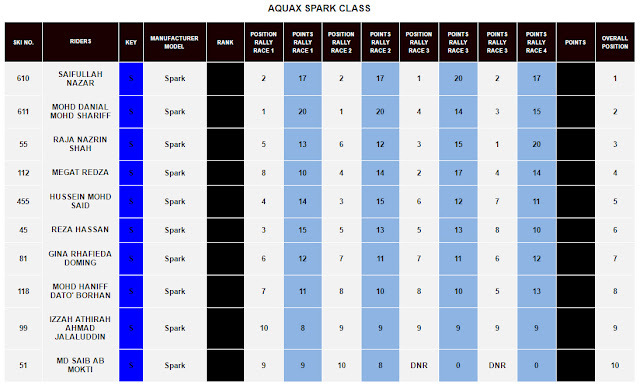 Experience what it's like racing in the Spark race by watching the video from a racer's perspective. The World Bachata Festival is over, you've seen the photos, here's the videos I've recorded over the course of the festival. I'll update this post over the course of the days as I upload the videos bit by bit. For a start, here's a highlight of the event. Just a simple video, didn't do any color correction and all, just simple compilation. For those looking for performance videos, will be uploading those and I'll update this post accordingly. The World Bachata Festival 2016 has come and gone, an intense 4 nights of performances and social dance and 2 days of intense workshops by international instructors. Below are the albums to all the photos for all the parties and the workshops. 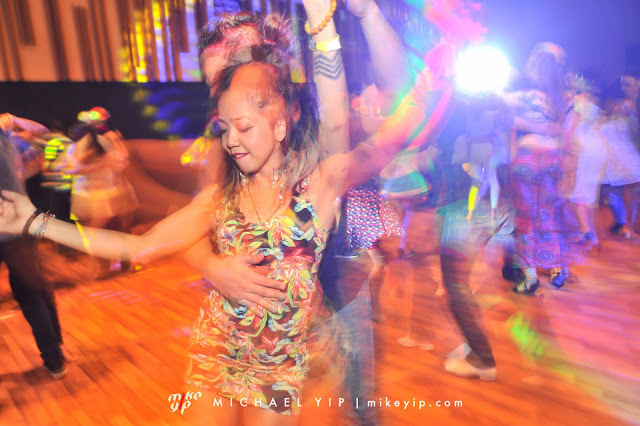 Made a lot of new friends, renew friendship with the old ones and danced til my shoes need to be replaced. I guess for a dancer, that's a good enough proof that we danced hard through the night when the shoes finally need to be replaced. The workshops was also fantastic, with each workshops filling to the brim as participants made full use of their time at the festival to absorb as much as they can from all the instructors. Even helping out at some of the workshops helped me grow as a dancer, whether I can remember the moves I executed at the festival is another matter. Anyway, I'm sure you'd prefer to see photos more than reading me talk about my time at the festival. Here's the photos from the Pre-Party all the way to the Mexicana night. That's all for the photos, the next post is the videos of the performances and a little montage from the whole event. If you'd like me to cover your dance festival, drop me a message. 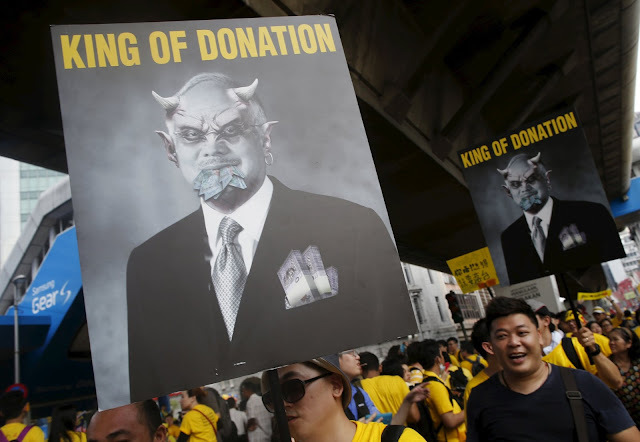 The BERSIH 5.0 is happening next weekend (November 19th), and with the Red Shirt clowns threatening to create troubles without any efforts from the authorities to stop them. We have to put in some efforts to stay safe ourselves. Here's some tips for those of you that's planning to join the rally, just to be on the safe side. It might not be as smooth running like BERSIH 4.0 that's well controlled with the only trouble being created by the Red Shirt baboons on the other side of the fence against RELA/Cops. Mask to help you breath better if the authorities choose to fire tear gas in your direction. Goggles to keep the tear gas away from your eyes. These days, there are those in the market with holes at the side so make sure you buy the ones without any holes. Change of Clothes so that you can change out of your clothes at the end of the rally. Waist Pouch to keep all your important documents & money nicely wrapped inside a plastic bag and make sure it's big enough to fit the above mentioned items. Phone (with waterproof casing) to make those important calls if you get into trouble. Small Packet of Salt/Salt Water in Spray Bottles will come in useful to neutralise the effects of the tear gas and to avoid chocking. Water to keep you hydrated during the long march. Please throw the bottle(s) into the rubbish bin and don't litter if you are using disposable bottles. Try not to bring too many items to the rally as you would want to be able to move freely. Keep your Jewellery, Wallet, rings, sharp objects at home. If you choose to bring an umbrella, use one of those collapsable ones so you can easily store it away when you are not using it. 2. Important Number in your phone. Make sure your phone is properly charged in case of emergency. Some of the handy numbers you should have in your phone. A team of lawyers from the Bar Council Legal Aid Centre (Kuala Lumpur), known as the Urgent Arrest Team, will provide legal assistance in the event of arrests. (3) The police station to which the arrested person has been taken (if known). The urgent arrest team will try to contact the arrested person and to arrange legal assistance as quickly as possible. Also, create a group in your mobile Chat apps so you can leave a quick message to your friends if you get separated from the group you are with. Aside from Whatsapp, you can use the FIRECHAT app as it works over Bluetooth and WiFi so you can communicate with a masses around you even when your mobile network is down. Among my friends and I, we uses Zello, which works like a walkie talkie system and can transmit data, images and recording across easily on top of FireChat as a back-up when we get separated. 3. Determine the locations of the meeting point. If you are going with your group of friends, meet up with the group before proceeding to the meeting points, if you decide to meet at the location directly, determine a landmark to use as your check-in location. A lot of people will be showing up at each of the location and it is advisable to plan ahead. Here's a reference on Google Map for the KL rally. Try not to drive into KL but use the LRT as your mode of transportation. 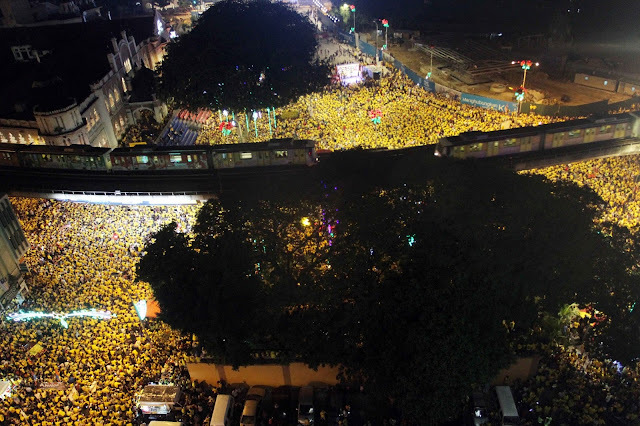 The authorities already announced that they are not giving approval for the BERSIH 5.0 and Dataran Merdeka will be on lock down. 4. Don't get involved in fights. As we are constantly bombarded by the media as a reminder, the Red Shirt Hooligans are expected to attack the BERSIH 5.0 rally just to make it look bad, they will no doubt have people embedded within the masses to help start the fights to give themselves an excuse to retaliate. If you see it happening, DO NOT JOIN IN! Move away from them and keep yourself safe. You need to be vigilant and look out for one another. If you spot anyone that looks and acts suspiciously, inform the committees that will be stationed around the rally stations so that they will take notice. If anything do happen, these guys will move in and stop those guys. Hopefully the places of worships will open their doors again to Rally Goers as places of Sanctuary when things get heated up. 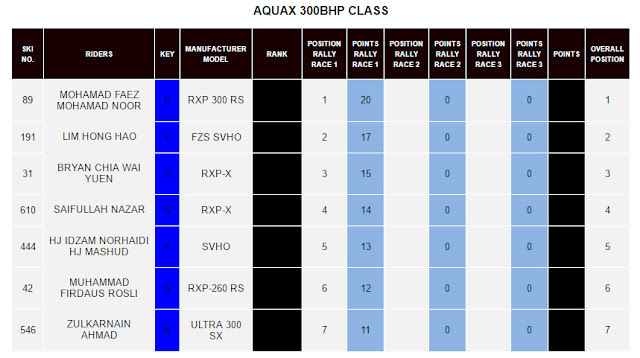 For now, here's the list based on the previous rally. They might do that again this round or more might open up so as I get the updates, I'll update this list accordingly as well. If you have friends coming into Malaysia for a holiday that weekend, do let them know that this is happening and if they don't want to get into any messy situation that'll spoil their holiday, to stay away from the areas that will be used as gathering points for BERSIH 5.0. For those attending the rally, please stay safe and stay calm. To err is human. But sometimes oversights can cause a huge financial blow to more than just your travel budget. 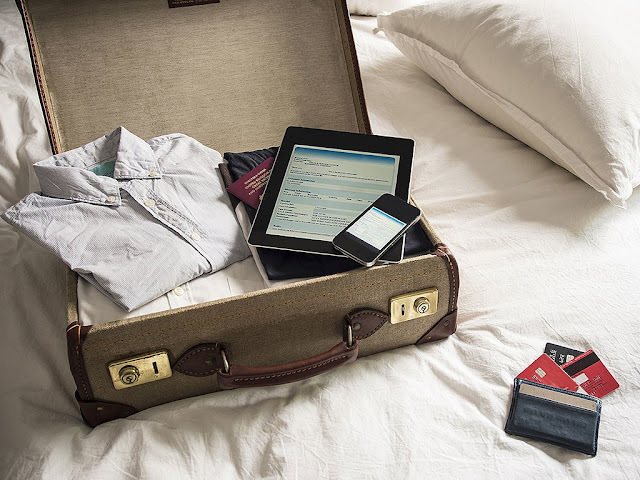 Steer clear of these costly travel blunders with these economical alternatives and insightful tips that won’t leave you high and dry before the big trip. Last minute tickets purchases will no doubt cost you. But getting them two years in advance doesn’t equate to cheaper flights either. In fact, you’re more likely to miss your flight than make it if you booked too early. Not only is that a huge inconvenience, more money is wasted on cancellation fees and having to purchase another set of tickets. The best time to book your tickets is six to eight weeks before booking your ticket (three to four months if you’re thinking of travelling during peak season) where prices are at their lowest. Airlines sometimes throw out flight promotions and special deals every now and then. Be sure to keep updated on these timely offers and act on them the moment they arise. The impression most people have of hostels as being a crummy dwelling filled with dingy bunk beds and bedbugs couldn’t be further from the truth. Hostels nowadays come with all sorts of amenities—free breakfast, satellite television, bike rentals, pool table—that are just as impressive as those of a boutique hotel, if not better! Only difference? It’s a fraction of the price. Why not give them a shot? They’re clean, affordable, and a great way to meet new people. There’s nothing wrong with splurging out on a meal every now and then. But you’ll be missing out a great deal of food and cultural experience by only dining at restaurants. Not to mention, you’ll also burn a huge hole in your budget. Why not try out the local flavours? Good food comes in all forms. Some of the best meals can be found in pop-up noodle shacks and roadside stalls. You don’t have to take my word for it. Try them out and see for yourself! Airlines can get very particular about their baggage regulations. Most only let you check one carry-on onto international flights, but you can be charged up to $100 for each overweight luggage (ouch!) if you’re not aware of your belongings. Purchase extra baggage space if you know you’ll be bringing home more than you brought. Or nip it at the source and simply pack lighter! Leaving your non-essentials behind instantly opens up storage space. That means more room for souvenirs and overseas goodies! We rarely think of the worst-cast scenario. But when something does go awry, ending up in a foreign hospital with no medical coverage is not where you want to picture yourself to be. Sign up for some travel insurance before you take off; you’ll be glad you did. Even if you don’t end up using it, it pays to be prepared than to deal with unexpected expenses. The MURFEST 2016 has come and gone, over 3 days of activities of Yoga, Fitness, Music and Dance roll into 1 venue, I would say has helped me reset myself. I didn't go for any of the yoga activities (too slow and peaceful for me), but just the fact that I can catch up with some friends, reconnect with some of the activities (didn't expect to do a lot of dancing which I did by the end of the event) and finding myself again by talking to some of the attendees. It was quite... enlightening. When Azzy asked me to check out the event, that was the last thing that I really thought of, in my head, aside from the dance bits, I thought that I'd be bored by the end of the 1st hour after I get there but I have to say, I was wrong and glad that I'm wrong about it. I didn't snap as much photos as some friends expected but these are what I've captured at the event. Amar Singh of Dance Blaze Academy also did a few workshops at the event and since I was there, recorded the practice videos to share so here they are. According to this Newsweek report, Richard G. Bribiescas, Professor of Anthropology, Ecology & Evolutionary Biology at Yale says that women are actually more attracted to the so-called "Dad Bod," marked by lower testosterone levels, less muscle mass and more fat. In fact, his research claims guys in this slightly huskier category are less likely to suffer from heart attacks and prostate cancer. That's not to say you should let yourself go. But from an evolutionary perspective, it makes sense. We don't have to kill mammoths or fight for caves anymore. Survival of the species is more about being faithful husbands and better fathers who stick around. In 2015, reports referencing the “dad bod” phenomenon started to emerge. The message came loud and clear: beer bellies are in, biceps are out. It has since become a term to describe the figure of a man with children who looks as though he balances midweek gym sessions with drinking heavily on the weekends. “This change in body consumption not only causes men to shop for more comfortable pants but also facilitates increased survivorship and, hypothetically, a hormonal milieu that would more effectively promote and support paternal investment. You've seen the photos, read the results, here's what it looks like on-board an ENDURO racer's ride during the race. The GoPro died with 20 laps to go, hopefully it's just a small glitch with the battery and I don't have to get a new GoPro. For a calmer look of the course, here's the video from the recce in the morning.